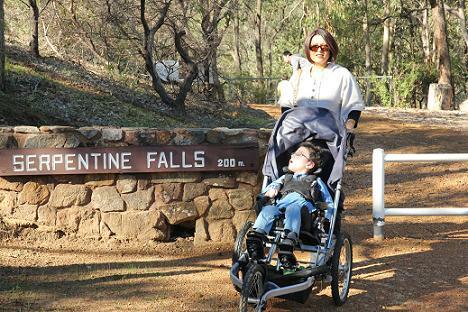 If you are looking for a fun and wheel chair friendly family adventure close to Perth then Serpentine Falls may be a location you should add to your weekend adventure list. Serpentine Falls is located within the Serpentine Falls National Park. The fall is a great location to take the family for a picnic or day trip or just for a swim on a hot day. You will find a well kept picnic ground set in easy access surroundings. The falls are located about 200 - 400m from the picnic grounds depending on where you park. The falls car park that is closer to the falls is suitable for disabled access. You will find a flat easy path leading down to the Serpentine Falls viewing platform. 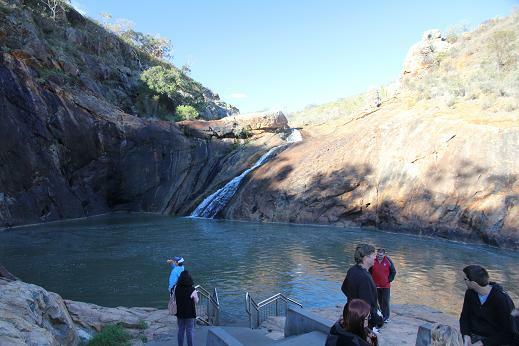 The viewing platform is a safe place for young children to view the falls and if you would like to go for a swim I recommend the you swim in the top water hole in front of the falls. There are dangers associated with swimming there so please read the safety signs at the sight and be careful with the nippers. You will find several bush walks that start near the picnic grounds. •	Kitty's Gorge Walk follows the Gooralong Brook, this Brook feeds the falls. •	Baldwin's Bluff Nature Trail takes you to the top of the Falls escarpment where you will be greeted with truly spectacular views of the falls and the coastal plains. You will also be able to see out over Mandurah, Rockingham and toward the Perth Skyline. Serpentine Falls, located in the Serpentine Falls National Park. This is a short drive from the town of Serpentine its about 1 hours drive from Perth CBD. 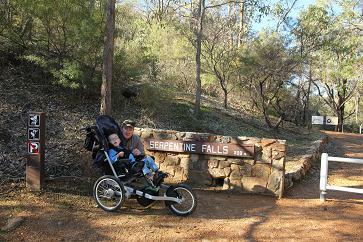 The Serpentine Falls National Park is open from 08.30am to 5.00pm daily, entry fee is approx $11.00 or free if you already have a National Parks Pass.